So this weekend I was playing with my new MacBook Air, getting it all set up with MAMP and whatnot, and one app I debated was Photoshop. I’ve never owned a copy of Photoshop – in college I “acquired” a copy, and since then whoever my employer was at the time has always purchased a license for me to use. I’ve never owned a personal copy. I’ve almost bought it at one time or another, but it’s just so staggeringly expensive it’s always given me pause. On the other hand Photoshop is a beast of an application, massive and bloated, with other unused applications (Bridge? Adobe Updater? WTF?) dangling off it like engorged ticks. Did I really want all that on my fresh new laptop? Yes, I know, GIMP. The GNU Image Manipulation Program, open source and fully functional, without the bloat. But not quite the same. Obvious in places, ineffable in others, it just isn’t as good. I was excited about GIMPshop, GIMP modified to look and feel more like Photoshop, but unfortunately from what I can tell, that project is dead, and hasn’t been updated in a while. It wouldn’t run under Snow Leopard – even after upgrading and downgrading the appropriate libraries that were supposed to coax it into running. Seashore is nice, a simplified GIMP compiled in Cocoa to be more Mac-like… that might be good enough, but lacks some things and I believe is also based on an old version of GIMP. I dunno… is Photoshop a necessity? What do you think? Posted on February 28, 2011 1 Comment on Photoshop Alternatives? I’ve been messing with netbooks, hacking them to run MacOS, and it’s mostly worked, but it’s never been a wholly satisfying result. Updates are an annoying and sometimes dicy process, and certain things (like the trackpad) never seem to work quite right. 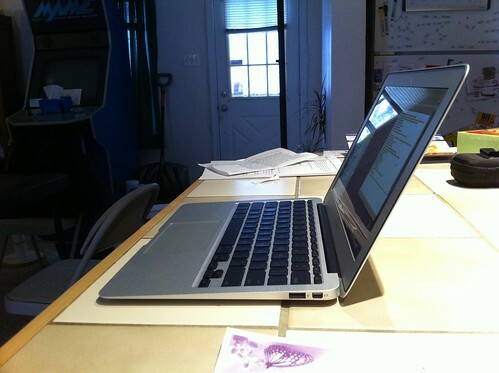 So I finally broke down and bought a real MacBook “don’t call it a netbook” Air (11″). 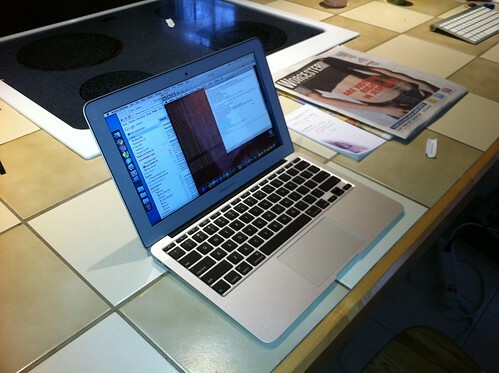 Carl gave me the handy tip to check the refurbished section on Apple’s site, doing so saved me a couple hundred bucks. So far? I’m very happy with my new Air! The screen resolution is just right – a little on the small side vertically, but not as cramped as 800 x 600 netbooks, plenty usable. It’s pretty light, feels sturdy, and it warm to the touch when it’s been running, but not too hot to actually use as a “laptop”. I installed the usual base of apps I use for development, plus Shimo and Remote Desktop so I can VPN to work when I need to. A few fairly recent marketing concepts should win the marketing equivalent of a Nobel Prize. Keep in mind this doesn’t mean they are good for you, or the environment, or anyone besides the companies who came up with the marketing. But for them, pure genius. Wait, soft drink companies can skip all the sugar, flavor, carbonation, and WORK, and just sell a bottle of plain water? And charge the same or MORE than they do for soda? Brilliant! Hopefully the person who pointed this out to Coke got a big promotion. I think Red Bull was the company to do this first – take soda, put in a little extra caffeine and a few supposedly “special” vitamins or whatnot, shrink the can down, and charge $2. They set the bar, and other companies followed in their footsteps. Take an existing product, shrink it down to a much smaller package, PROMOTE the fact that you have shrunk the size of the packaging, and bump the price by weight way up. Not only will people not complain that they are paying more for less, they will actually THANK you for it! Genius!